Walk into a Costa Coffee Shop and you’ll notice it’s a little different to other coffee shops. Firstly there’s the warm and welcoming atmosphere. Then there’s the carefully chosen food and authentic coffee drinks. Next the Ferrari of coffee machines and finally, the most passionate and well trained baristas around. Top quality coffee is now available wherever and whenever it’s needed. You see, Costa Coffee only ever use fresh milk and real Costa Mocha Italia beans to brew their coffee. So whether you fancy a latte, cappuccino or hot chocolate, you can now be sure of the freshest taste as well as the finest ingredients, just the way it should be. 1. Pick up you Coffee Club card in-store or download the APP. 2. Register your card online. 3. Simply swipe or scan whenever you visit and you’ll earn 5 points for every €1 you spend. To spend your points, protect your balance and earn 100 bonus points you will need to register your card online at www.costaireland.ie. Just check your balance and once you have collected enough points you can select and enjoy your free treat. 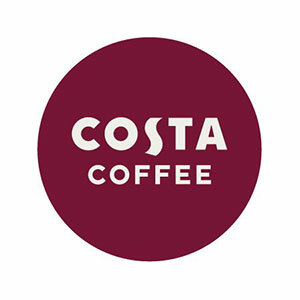 Pick up your Costa Coffee Club card in-store today and register your card online to start enjoying the benefits such as points, special invitations, free unlimited WiFi in-store, exclusive members only offers and secure balance protection should you misplace your card. Visit one of the branches at Westend Shopping Park or Westend Village and discover distinctive Italian style coffee, hand crafted by award winning barista’s and tasty snacks to be enjoyed in-store or on the go.